Picked up a couple Lews Mach Crush spinning reels yesterday. Sadly the old Shimano Symetre's were starting to fail. First new reels for me in probably 10 years. Went out on my lake yesterday for testing. They really feel nice. Even caught a couple on Blades. Water is 36-39 degrees. Nice looks like a Powell Rod..
Yep. Powell drop shot rod. Only thing you need to fish Union Lake. Old nasty Blade Bait that catches them like crazy. My Symetres are still pretty good mechanically. Too bad they quit making them. 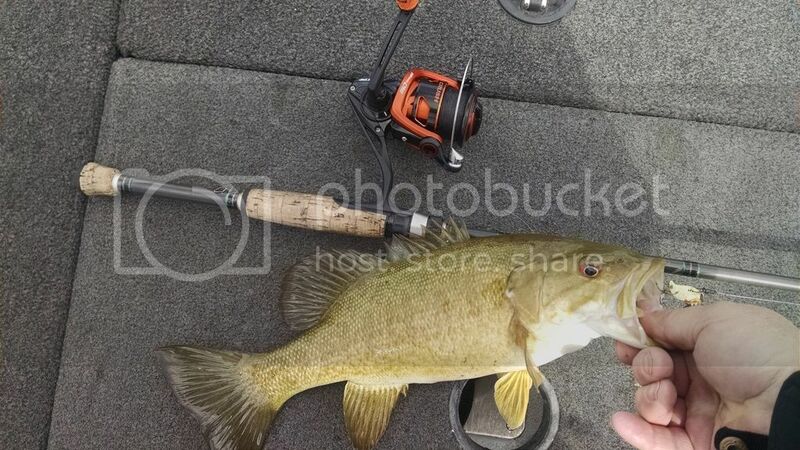 We'll be able to see you better from farther away now with that reel! I am a Root Beer drinker but I may have to switch to Orange Crush. I got on upper straits last week and the water temp was in the low 40s. Union most take longer to warm up! I was out yesterday in my aluminum boat. Water is 41 degrees. You can see 20 feet down. Caught 10 bass. Actually saw 3 pick the blade off the bottom. Probably won't be fishing again for at least a week or 10 days. Family stuff to take care of. Always amazing that they'll grab those metal blades right off the bottom! Boy... 7 to 10 days from now lots of lakes will be completely different lakes with the appearance of a real warming trend finally being here!? !